Once you hang this on your inside handle, if anyone from the outside touches the knob, the alarm will go off and you will know someone tried to enter without knocking. Protect Your Entrance! Once you hang this on your inside handle, if anyone from the outside touches the knob, the alarm will go off and you will know someone tried to enter without knocking. Polite people knock and await your arrival to let them in. Bad guys will try to open it to see if it is unlocked. This will let you know immediately if anyone tries to gain access to your home, motel room, or even bedroom. Makes a great portable security device for travel. Acts as an additional security layer to pre-warn you of an attempted break-in or unauthorized entry. This 120 dB alarm is dual purpose. It acts as both a burglar alarm and a personal alarm. Hang it on the inside of any metal doorknob and it instantly and automatically sounds when an intruder grabs it from the outside. If someone touches the door knob, this alarm will blast away! Excellent sleepwalker alarm. Hang on the door and if the sleepwalker tries to leave the room, the alarm will sound. 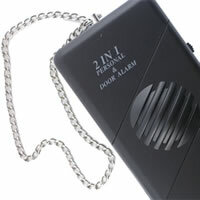 As a Personal Alarm - Carry it with you and just pull out the metal chain to sound the alarm and deter an assailant. 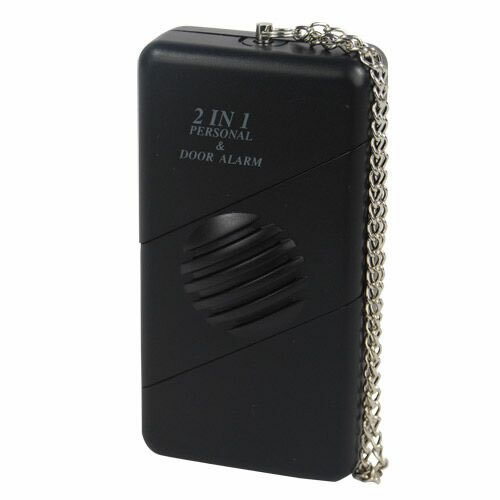 The 2-in-1 alarm may be placed in hand, pocket, or handbag with the attached metal chain wrapped around the wrist so that if the user is being attacked, or the handbag snatched, the metal chain is pulled out and the alarm is activated. Sounds instantly when an intruder touches the knob. Operates on all metal door knobs. This alarm works on wooden, composite, and plastic doors that have nonmetallic frames. Does not work on metal ones. If you need one for that, try this one. This multi-purpose security device is great for home or away. The door handle alarm does its job while you sleep or just want privacy and want to know if someone is about to come inside. Dimensions: 4 ¼" x 2 ¼" x 1"
"Just got back from an overnight camping trip. Had a good time and the kids even caught a fish. About a foot long bass. Had to throw it back though because this pond was catch and release. Next time we go, we will go to the big lake and catch us some dinner! Even during camping, you have to think about security. Make sure your vehicle is locked and if you have a camper like we did, make sure the doors are locked too. One of these will awake you and everyone else if someone tries to enter in the middle of the night. Just hang it on the knob on the inside of your camper and sleep peacefully. Great inexpensive security alarm." This device works well on wooden doors, but not metal ones. Also the alarm siren is not as loud as other devices (such as the door stop alarm).